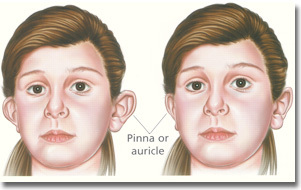 Some children and adults are unhappy with the shape of their ears because they are too big, stick out too much, or are uneven in shape (asymmetrical). Teasing and taunts may result in a loss of self-confidence in these individuals. Ear pinning surgery to make ears appear more normal can help to restore self-confidence. Otoplasty (prominent ear surgery) is a surgical procedure to change the angle and shape of protruding or uneven ears in children and adults. Otoplasty is also called pinnaplasty, or 'pinning back the ears', or 'correction of the ears' or 'ear pinning'. You may hear your surgeon use these specific terms. During Otoplasty the surgeon reshapes part of the cartilage in the ears, allowing them to lie closer to the side of the head. An advantage of otoplasty in children is that a child's ear cartilage is soft and easily moulded. In teenagers and adults, the firmer cartilage of fully formed ears does not allow the same degree of moulding found in children. Otoplasty can however, still be effective in teenagers and adults. The complete 'Otoplasty' prominent ear surgery pamphlet is available from your cosmetic surgeon, Mr Murray Beagley.